Since the vision of creating a dedicate children's service began in 2005 with Howard Flannery, Ann Norton and Frank Cassidy the absolute necessity to fundraise and promote the charity's profile was paramount. The parents motivation was personal as they each had first hand experience of the challenges facing children with special needs on a daily basis. Each year we manage to raise €250,000 through walking, running, cycling, climbing, shaving, baking, boxing.....you name it.... parents, families, friends, and communities have come together to help raise essential funds. 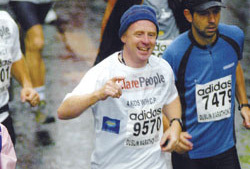 As a result of fundraising there are now Clare Crusaders running, walking and cycling clubs that have brought together over 300 people training together under the name of the Clare Crusaders Clinic. We work to continuously to develop the Clinic's profile as we have done through our Official Charity Partnership with Munster Rugby, winning an All Ireland Pride of Place Award, and as a Social Enterprise in the Ulster Bank Business Achievers Awards National Finals. We also work with businesses who might consider the Clinic as a partner for their Corporate Social Responsibility activity. Without the support of the people of Clare and their extended families throughout Ireland we would not be able to keep our clinic open. However, we are determined to meet our commitment to the children of Clare so look out for those orange shirts running, walking or cycling the length and breadth of Clare because its for a great cause. How do we spend money raised on our behalf? 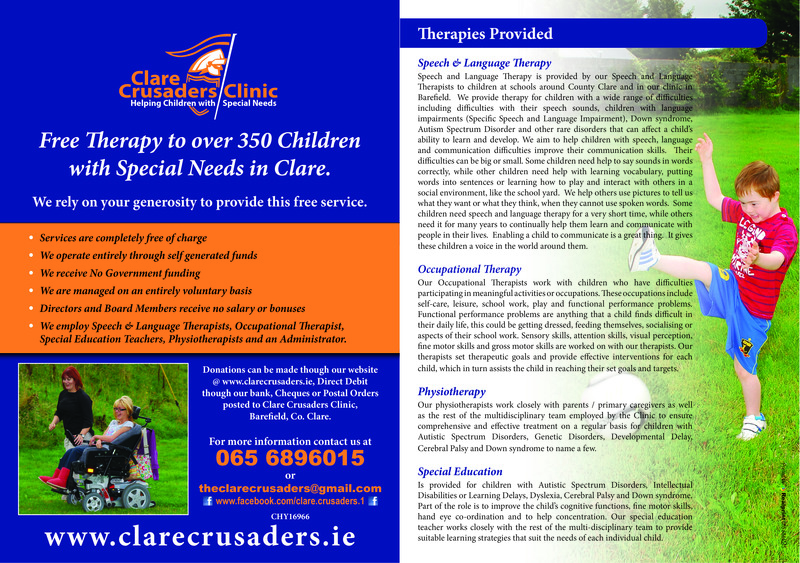 The Clare Crusaders Children's Clinic is the ultimate social innovator across a number of levels. In total we are providing approximately 10,000 hours of therapy annually to over 350 children in County Clare at a cost of €250,000 annually. The Clinic is managed on a voluntary basis ensuring all funds raised go directly to children's services. We have to ensure we are providing access to the most up-to-date therapies and treatments while at the same time make certain we continually raise funds to ensure families can access our services. Our future priorities are to attract more funds to invest in our premises, equipment and staff. We have longer term plans to move into a bespoke building. The response from parents has been overwhelmingly positive and we are happy to report significant improvement in many children receiving hands-on therapies.